Product prices and availability are accurate as of 2019-03-11 17:30:38 UTC and are subject to change. Any price and availability information displayed on http://www.amazon.com/ at the time of purchase will apply to the purchase of this product. Web exclusive! Equip your kitchen for everything from fried steak to bread pudding with the Paula Deen Signature nonstick cookware set. 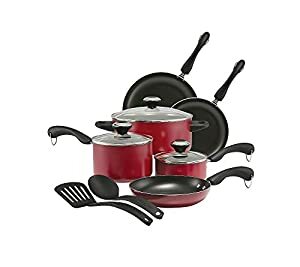 An 11-piece collection, it features a trio of fry pans, two covered saucepans and a matching Dutch oven, all boasting high-quality nonstick for easy food transfer. A slotted turner and solid spoon complete the set, ready for countless cooking tasks right out of the box.